Born in London just at the end of WWII, his family moved to Abergavenny, Monmouthshire when he was four years old. At HCS, he won the George Robertson Sinclair scholarship, which was introduced in memory of G R S, former organist at the cathedral at the end of the 19th Century and a friend of Sir Edward Elgar. 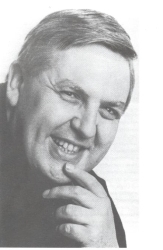 Noel became sub-organist to the cathedral under the leadership of Dr Melville Cook ( Organist & Master of Choristers 1956 - 1966 ) and founded the St Cecilia Singers during that time, when he conducted his very first concert. On leaving HCS, Noel studied at the Royal College of Music where Sir Adrian Boult was one of his teachers. He then joined the Sadler's Wells Opera in 1967 then in 1974 was principal conductor of the London Welsh Festival Chorus. A year later he was appointed resident conductor to the English National Opera, where he remained for nearly 30 years. A Memorial service was held on 7th July 2008 at St Martin-in-the Fields, Trafalgar Square and was attended by many of the country's leading musicians. A fitting tribute to an unassuming, mild mannered person. Michael Walling had met Noel in 1997 and wrote to the Club giving a detailed account of N A D's professional life and experiences as a musician. Members wishing to find out more can click on this link which will take you directly to the header page for the 2008 edition of the Old Herefordians' Newsletter. Select view and wait for the document ( 40 pages ) to appear. Then scroll down to page 31 to view Michaels' eulogy piece.